Smoked salmon can be purchased in two forms: Hot smoked and cold smoked. Hot smoked salmon is literally cooked during the smoked process, which makes it firm and very salty. Cold smoked salmon is not cooked, and it has a very delicate and creamy texture. Scrambled eggs are easy to make as long as you follow a few rules. Make sure you start with clean, uncracked eggs for food safety reasons. Break into a large bowl, making sure no shell is broken into the eggs. Beat the eggs just before you are ready to cook them. Add a bit of cream or whole milk; this helps keep the eggs fluffy. Only cook eggs in butter; don't use margarine, which can add an off flavor. The cold smoked salmon will cook in this recipe, but it will stay soft and tender. The eggs should be served immediately when they are done for best flavor and texture. Serve with fresh fruit and some coffee cake or sweet rolls, along with orange juice and coffee. Cut the smoked salmon into small pieces and set aside. Use a sharp knife or kitchen shears. Add the egg mixture to the skillet. Cook, stirring occasionally with a heatproof spatula until the eggs are almost cooked but still shiny and moist. Scrape the bottom of the skillet with the spatula and turn the eggs over as they cook. This should take about 6 to 7 minutes for 12 eggs. 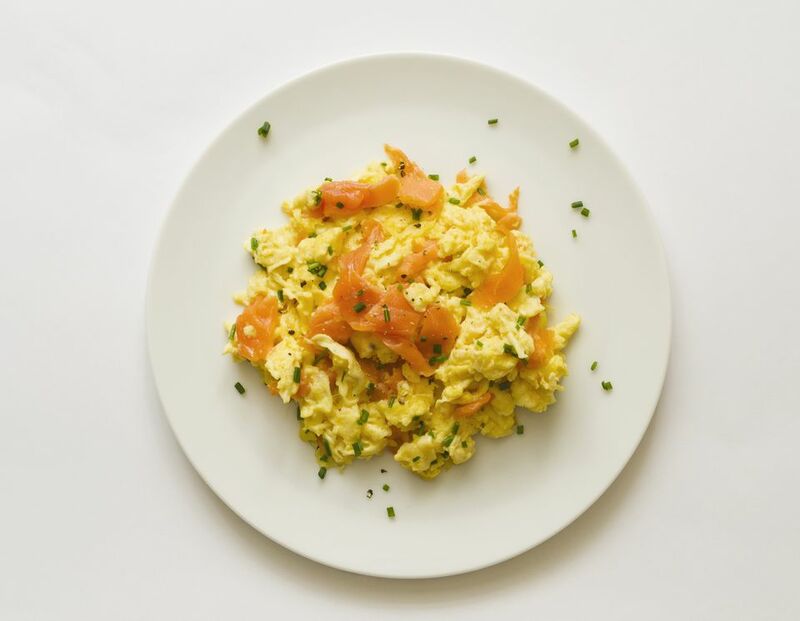 Stir the salmon into the eggs; cook for another minute or two until the eggs are cooked to 160 F. Serve immediately.